I often think about the animals that scurry through our garden at this late hour, the hedgehogs, polecats, foxes (lovely animals, despite being a relative of the wolf and not very chicken friendly!) shrews and rats ugh! And of course the mice! With less competition at night, the bat with its leathery wings, is a frequent visitor to our garden and contrary to belief, the bat is not blind. In fact, bats often have better eye sight than humans. There’s an owl that rests occasionally in the tree by the pond. With her heart shaped face, she has her eyes on shrews with their voracious appetite. 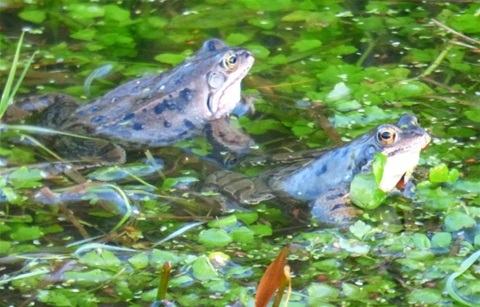 And oops I mustn’t forget the frogs and the newts all gathering in their birth place and and soon to arrive are the toads with their warty skin and squat bodies. Sleep well all of you!